I get more queries about house plant cultivation than any other type of gardening. 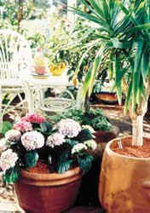 In fact, house plants are not difficult, providing you understand a few simple points. House plants are not a special plant family. They are generally plants that cannot withstand cold temperatures, so in a cooler climate, they must be grown indoors. They must, however, be given conditions as near to those where they grow in the wild, and are not primarily inanimate ornaments. No houseplant will survive indefinitely in a dark corner; many cannot stand hot, dry, stuffy rooms, and most will be killed in a short time if they are overwatered, although many can be revived if they have become short of water. Light levels are always lower indoors than outside, so give your houseplant the lightest spot you can find, although many will not take to direct south or west sun in summer; if this is the case, move them out of the sun until the autumn. Buy a good house plant book, preferably one that gives the country of origin and describes the conditions where the plant can be found in its native environment. Once you have bought your plant, find the position in your home that matches these conditions as nearly as possible. This will help your purchase to re-establish as quickly as it can. Always buy from a reputable source - generally this is not a garage forecourt or a dark shelf in an ironmonger's shop. Some garden centres have better facilities for displaying house plants than others - ideally they should have areas with differing temperatures and light levels where the plants will be reasonably happy until they are sold. Check that the compost is not bone dry or soggy, and that smaller plants do not need immediate repotting. If the plants have clear plastic sleeves, try to inspect all the foliage, which can soon rot if bunched too tightly together. Never buy a plant which is not at its best; yellow, brown or falling leaves can indicate this. Repotting is not a routine job for many house plants, and many will survive for some time completely pot bound if they are well fed and watered. Resist the temptation to repot a brand new acquisition; let it settle down for a few weeks first. The obvious indication that a plant needs repotting is when the new growth starts to become stunted. Repotting should only take place in spring and early summer so the roots have a chance to become re-established before winter. Choose a pot no more than one or two sizes larger so there are no large pockets of compost which can become sour before the roots grow into them. A multi-purpose compost is suitable for smaller specimens, although a soil based John Innes type is better for large plants which may only need further repotting after several years. A newly repotted flowering plant will start making fresh foliage first, and can stop flowering until the roots have reached the sides of the pot again. For this reason, it is best only to repot flowering houseplants when they stop flowering even when regularly fed. Late winter is the time of year to begin feeding again after the winter rest. Any liquid or soluble plant food is better than none at all, but a balanced feed (such as Baby Bio) is more suited to foliage house plants, while flowering ones will perform better with a high potash feed such as Phostrogen or a specific tomato fertilizer. If you have a cool room, or even better, a conservatory, bring some colour into your life at the end of winter by growing some flowering house plants. Those that should keep flowering for several weeks include indoor cyclamen, cineraria, jasmine, chrysanthemum, indoor azalea, and, if you really want to treat yourself, orchids. All these last longest if given a position at this time of year in full light; you should pick off dead flowers regularly and keep the compost moist but not wet, the exception being the azalea, which likes to be grown in very damp compost. Feed weekly with a flowering houseplant food to prolong the display. Spring bulbs are an inexpensive, colourful and often fragrant way to cheer up a winter and early spring home. If you potted your own last autumn, check them every few days to see if they are ready to bring into the light. With hyacinths this is when there is about 3-4cm of growth and the flower bud is well developed; narcissi and tulips should be about 6-8 cm tall. Place in a cool, shady place until the shoots have started to turn green, when they can be placed in a light window to flower. Do not let them get too warm or the growth will be straggly and the flowers soon fade. If you did not manage to pot up your own, garden centres will have a good selection now. Keep well watered and feed regularly with a general liquid houseplant feed, and remove dead flower heads. When all flowers have faded, move the pots into a cold, light place such as a garden shed or garage window, and continue to feed and water until the temperature outdoors has warmed up sufficiently to move them outside, usually sometime during March. When the leaves have started to turn yellow, the bulbs can be planted in the garden to naturalise. During winter and early spring, your permanent houseplants may start to appear rather tired. A little attention will make them look altogether different, and the plants will benefit greatly from some loving care. Remove dead and dying leaves, pick fallen leaves off the top of the compost, trim off dead shoots and wipe the leaves over with a damp sponge to remove dust and restore the shine on leathery foliage. Plants with large, smooth leaves, like aspidistra, Swiss cheese plant and rubber plant, can be sprayed or wiped over with a leaf shine liquid for even better effect. Check for pests and diseases, which can remain active throughout the winter on indoor plants. Spray with an insecticide and/or fungicide if necessary – hard to control pests like woolly aphid, mealy bug and scale insects are best dealt with by watering the compost with Vine Weevil Killer, which makes the foliage poisonous to pests and has a residual effect of 3-6 months. Do not be tempted to repot at this time of year, even if a plant looks pot bound.